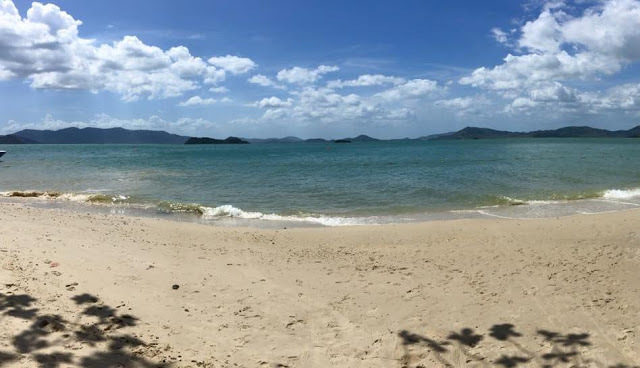 After spending a few days in Bangkok, we moved onto Phuket Paradise. Taking off from Bangkok International Airport, we had a domestic flight with Air Asia for a 1 hr and 30 min flight to Phuket. When we landed in Phuket and grabbed a taxi to a south district of Rawai and was greeted by a small tropical rain storm which was still warm but somehow refreshed the heat from the day. We arrived at our resort Navatara and were again greeted by smiles and the loveliest hotel staff who helped us with our suitcases and offered us a cold glass of mango juice to quench our thirst. We had another smooth check in and was showed to our rooms, which again featured 2 double beds for us each and a sliding door onto the balcony which overlooked our infinity pool. The bathroom was again gorgeous with a walk in shower, bath, wash basin and toilet. We refreshed and got changed before heading out to dinner which we decided to eat at our hotel as we were quite tired and wanted to check the hotel food out first. I had a Fanta Orange and Chicken Satay for a starter and then Prawn Pad Thai Rice in a carved out pineapple. Then we headed to bed to refresh for the next day. Waking up to the peaceful birds singing away and got ready to head to breakfast. We had an array of juices from water, orange and pineapple juice to more unusual ones such as Roselle juice. A small range of cereals and milk, a coffee and tea machine, a range of bread and toasters, small pastries and more warm things such as bacon, sausages, warm Thai dishes and fresh fruit. They also had a menu were you could order waffles, pancakes and full english breakfast dishes which I had waffles on my first morning with chocolate chips and caramel and chocolate sauce. On our first full day, we mainly stayed by the pool and got acclimatised as it was a lot hotter than in Bangkok. Our hotel is very small with only 14 rooms, 6 of them walk straight out into the pool which you pay more for but we booked our rooms on the second floor. The hotel has an incredibly peaceful and relaxing feel to it, with a small gym, spa and Jacuzzi in the pool on location – it’s the perfect place to relax. You can order food and drink from the telephone by the pool to get delivered to you on your sun bed and with an infinity pool and child’s pool it’s the perfect place to relax after a hot day exploring Phuket. It also has a bigger gym and Muay Thai training centre across the road, plenty of people come here on fitness retreats and to get into better shape. We also had a small selection of restaurants a nearby beach and 2 small supermarkets round the corner in case you needed anything. After relaxing by the pool all day and getting very hot and bothered we went back to our rooms to refresh and head out for dinner. We caught our hotel bus taxi service to a nearby restaurant Nikita’s which we head was very nice, which is on the sea front and has a very Hawaiian feel to it with sand under your toes and wooden seats and chairs. Also with large lantern lights hanging from the trees and the lights from the nearby pier it was the perfect setting. I chose to have their battered seafood platter which was quite a lot of both but I really enjoyed it. After letting my food go down, I had just enough space to try their Chocolate Ice Cream Milkshake which was really nice. After dinner, we then visited a nearby bar where I tried my first Strawberry Barcardi Breezer which I normally have the Orange or Watermelon ones. The next day, we caught our hotel bus taxi to a nearby beach and spend the day on the beach. It was super hot we had to borrow umbrellas to get some shade but it was still unbearably hot. The sea was crystal clear and so blue – it was picture perfect, with white sand stretching for miles. I got this picture of a cute black dog sleeping in our shady bits, it was there for ages. We then got cold drinks and small snacks in a cafe near the beach before catching the bus taxi back to the hotel to get ready for dinner. We had dinner at Mamma Mia’s which did really nice food, me and my mum had the same – we both had their chicken kebabs which were delicious. The next day we caught a taxi into Phuket Old Town, which is known for it’s old fashioned looking buildings and architecture. Dad had read about a few places there so we checked them out before finding a place to grab a cold drink. We had drinks in a cafe called Kopitiam by Wilai. I had their Strawberry Lemonade Soda which was really yummy and refreshing. We checked out a few more places before stopping in an old Argentinian prison restaurant called Raya for dinner. We had a mixture of dishes and shared them around, we had: chicken and cashew nuts, crab meat curry and noodle balls, pad thai, fried prawns and fried meat chunks. It was a really yummy meal! We then grabbed a taxi back to our hotel to sleep. The next day we chilled by the pool again before catching our hotel taxi to Promthep Cape Viewpoint to watch the sun set. There was so many people who caught organised trips there, especially lots of Chinese! The sunset took a long time, but it was definitely worth it when it was done. Turning the sky pink and orange. We then caught the taxi back to the hotel ready for dinner. The next day, we caught the taxi to our local ferry dock and caught a 2 hour ferry journey to Phi Phi Island. Whilst on the boat they played the movie 2012 to entertain you throughout the journey. We stayed for one night in the small hotel called Bayview which was alright, very basic but perfect for one night on the island. To enter onto the island, each person has to pay 20TB (Thai Baht). To help with the clean up of the island as they receive so many visitors and cleaning up the island is a very big task. 20TB is nothing converted into the GBP, it’s something like £4 which we didn’t mind paying. We explored the island during the day. But it was unbearable hot. So me and my mum took shelter in a cafe. And got a nice cold drink with views of the whole island. Whilst my brother and Dad explored the viewpoint which was up lots of very steep stairs. We had lots of fans and nice cold drinks to keep us cool. Whilst we had a chat and gazed into the views around us. If you haven’t heard of Phi Phi Island, it’s a very small and gorgeous island. But it’s also known as Party Island. Where lots of tourists stay to get drunk all the time and party. It’s like the Thai Ibiza or Magaluf! We had dinner in a restaurant called The Rock which was shaped like a boat on a rock which was really cool and I had a yummy Sweet & Sour Chicken with steamed rice which was really nice. We then ventured and got drawn into a nightclub bar. Where lots of drunk people seemed to be hanging and getting with each other/dancing together. Had a few drinks before heading back to our hotel only to encounter two drunk people. And 1 guy who wasn’t that drunk. But wanted help finding his hotel and we also had a chat about football. He was actually a really nice guy. Then the other was sprawled out on the beach laying on his back smoking. Whilst his girlfriend who wasn’t too far away kept calling his name. My brother then got the guy to stand up. However the guy proceeded to walk towards the sea. And my brother had to rescue him before he went any further. The next day, we had breakfast in a nearby cafe before heading to a local beach to spend the morning. We then left for the dock to catch our ferry back home. The sea was crystal clear and many shades of blue. It was spectacular and clearly breathtaking. I couldn’t help but take pictures. We boarded the ferry for our way back to Phuket, this time they were playing Avatar on the tv to help pass the time. We arrived back to our hotel in Rawai and showered before heading out to dinner at Rawai View, which was a near restaurant Dad had found on his run which had a really nice setting and did really nice food. The next day, we had breakfast at the hotel before Lek. Our personal taxi driver picked us up to take us to a few tourist attractions around Rawai. Our first stop was Kok Chang Elephant Safari. Which Dad and Ross road an elephant around some pre-made paths whereas I stayed behind. And took some photos as I didn’t agree with the way Elephants are treated and being ridden by tourists. The next stop was The Big Buddha which is made entirely of marble. And can be seen from many places in Phuket. It was so pretty to take photos of. However there was scaffolding all around it as they are still building new parts of it. It had lots of other buddha’s around it, one for each day of the week to be exact. The next stop was The Gibbon Rehabilitation Project and the Waterfall. We learnt about how many Gibbons and wild animals are illegally kept as pets. And used as tourist attractions in Thailand. And how much it can badly affect their growing up and development for the wild. We learnt about one Gibbon in particular who was kept as a pet and had her hand decapitated. She was left with only 2 fingers on her other hand as she didn’t mean to injure a child. But the Gibbon being a wild animal didn’t know what she was doing. It was heartbreaking to hear how many Gibbon’s are harmed and sometimes even killed. They have 22 Gibbon’s on site who are in rehabilitation. Plus the one who was badly harmed who is now a permanent resident on this site. Who will be unable to return to the wild. We were able to view the Gibbon’s from their cages. Two of them were singing to their hearts content. Which was quite a sight and thing to hear. I then spotted a really cute Gibbon called Arya (yes from Game of Thrones). Who was so adorable and her story really got me. So I decided to adopt her for a year where I will receive updates. And photos of her progress and obviously be notified to when she’ll be able to go into the wild. Also the money I donated will go towards caring for her and paying for medical bills and food etc. We then visited Kok Chang Temple which was stunning before returning back to the hotel for dinner. I know of a few people who have gone to Thailand and your photos just prove how incredibly beautiful it is! You got to see a lot of incredible things and I'm looking forward to reading more about your adventure!